If you haven't been looking at your HubSpot Conversion Assists report lately, it's probably time to crack it open. Take a look under the hood at what pages on your site are helping turn visitors into leads and leads into customers. The Conversion Assists report, available to professional and enterprise-level HubSpot users, can help you identify and improve upon highly influential pages on your site, enhancing your marketing funnel for greater lead generation. Many analytics platforms show you the first page a site visitor or lead saw, and the last page they exited on. Your report on assisted conversions fills in the gaps and shows you the number of contacts that viewed any site page, blog post, or landing page before converting into a lead or customer and credits them with an "assist." But even with assisted conversions doing most of the heavy lifting, it can be hard to know where to get started. Here are 4 Great Uses of the HubSpot Conversion Assists Report to get you on the right track. 1. Identify your top performing pages. As always, it’s best to start with the basics. Before anything else, take the time to find out which of your site pages are performing best. The HubSpot Conversion Assists report makes it easy to tell at a glance which pages are converting visitors into leads and which are converting leads into customers, over any timeframe you'd like to analyze. In fact, conversion assists for leads and conversion assists for customers are shown on different tabs to avoid confusion. 2. Note trends in your top performing blog posts. In an age where keyword data is encrypted, marketers need to turn to other tools at their disposal to qualitatively and quantitatively measure the success of their marketing efforts, especially when it comes to blogging. Even with the help of your Conversion Assists report, this will take a little detective work. With your top posts laid out before you, patterns should emerge indicating why certain posts are more successful than others. For example, look at titles, topics, and trends within target keywords that are converting at a high level, and compare the top posts to your editorial calendar. Draw as many logical conclusions as you can. Is the layout of your top posts a factor? The content? CTA placement? Take a hard look at what works to drive conversion. 3. Optimize your landing pages & premium content strategy. Now apply the same deduction and logical reasoning to your landing pages. Which landing pages help you convert visitors to lead? Which offers help convert leads to customers? If you're looking at your page performance and conversion rate you likely know which pages convert at the highest rate, so why use the Conversion Assist report? It’s likely you’ll discover certain types of offers or certain topics or formats have more assist than others. This is a good indication that your audience prefers content delivered in one format or over others (such as eBooks over white papers). Likewise, you may find your audience prefers certain topics over others (content strategy over demand generation, for example). Also look to see if your offers are falling into the funnel where you hoped they would. For example, when looking at the lead to customer assists you should be seeing a greater percentage of middle of funnel offers appear, if you see lots of top of funnel offers instead, it's probably time to take a step back and reassess your funnel mapping. Use all of this to inform your content creation efforts in the future. 4. Improve poorly performing pages. Identifying which of these problems pertains to a certain web page will put you on the right path to fixing it; in other words, this will let you determine whether the underperforming page itself is the problem or the pages it’s linking to. From there, it’s a matter of applying what works on your top-performing pages to your less-effective ones. 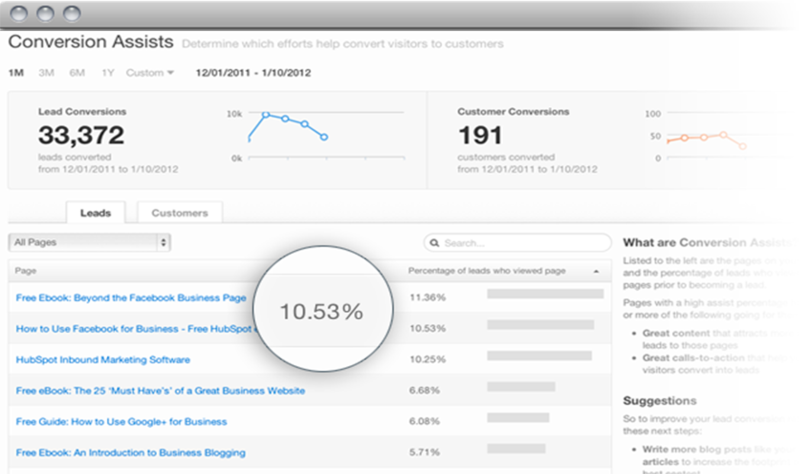 The HubSpot Conversion Assists report is a great way to tackle your site’s marketing efforts from a different angle. Use it and the tactics above to increase conversions on your site, leading to more efficient lead generation and an overall healthier site. What are your favorite ways to analyze assisted conversions? Let us know in a comment below.